This is will be the first in a series of 3-4 posts. The subject is multifaceted and subtle. Nuances can be hard to convey in words and accompanying illustrations; it’s easier to do in talks, with bark chips in hand to provide a more visceral sense of what’s being described. Still, it seems important to make the effort. I realize now while my initial approach to evaluating feeding sign was rigorous, I grew somewhat lackadasical and overconfident. I also got distracted by the abundant scaling on downed sweet gums we started finding a year or so ago. I’m now confident that squirrels did much of this scaling, but the same does not apply to most of the other work we’ve found over the years. Even before we discovered that squirrels were scaling bark on downed sweet gums (and quite possibly on standing trees as well), I was contemplating a post that broke down the bark scaling we’re finding into several categories. I was aware of having gotten away from the criteria I had laid out in the past and was feeling a desire to be more specific. That seems like a good place to begin, before delving too deeply into the nuances of distinguishing between squirrel and putative ivorybill work. Scaling on standing boles, low enough on the trunk to be examined up close. This includes both standing trees and ones with tops broken off. The sapwood of trees in this category has multiple large exit tunnels. The most prevalent species in this category is bitternut hickory, which has very thick, dense, tight bark, but we’ve also found it on sweet gums and oaks. This scaling is extensive and has a distinctive pattern that’s immediately recognizable in the field, an almost jagged appearance, although the actual edges are curved. The tree on the homepage is one example, and the image below illustrates how even when the scaling is not recent, this distinctive appearance remains. Bark chips are easiest to find for this type of work. Old scaling on hickory, 2015. Note the exit tunnels and the absence of other woodpecker work, save for a small dig near the top of the scaled area. Scaling on standing boles, low enough on the trunk to be examined up close. Few or no large exit tunnels but signs of insect infestation under the bark. Superficial bill marks may be evident in the remaining cambium or on the surface of the sapwood. Tree species in this category include sweetgums and oaks. Chips are similarly easy to find. Scaling that has the appearance of the work in category 1 but that cannot be examined up close. No possibility of examining bark chips. Scaling higher on boles and lower branches of standing trees where exit tunnels may be visible, but close examination is not possible. In some cases, these trees are seen at a distance, across water bodies, so there’s no opportunity to look for chips. As is the case in categories 1 and 2, older scaling may go untouched by woodpeckers for extended periods. The first example below is recent; the second is probably more than two years old. Older scaling on dead top with exit tunnels. Scaling on higher branches of standing trees. Since these are often seen at some distance and in poor lighting conditions, it can also be more difficult to assess the freshness of the work, and the nature of infestation. Bark chips are usually much harder to find under these circumstances. Squirrels typically girdle limbs and often scale on the undersides of large, higher branches. Thus, when larger branches are at less than approximately a 70 degree angle, work on the underside may indicate a squirrel as the source, while the presence of extensive scaling limited to the upper side may be strongly suggestive of or diagnostic for woodpecker. Scaling on downed trees or limbs that are at least in part more than 4’ from the ground. Scaling on downed trees and limbs that are mostly or all horizontal and less than 4’ from the ground. Work now suspected to be squirrel on downed sweet gum. There’s an additional category that is somewhat different from the others. This involves work we’ve found on freshly dead, small sweet gums (>1’ dbh) with evidence of ambrosia beetle infestation. These trees have been stripped of bark, with some accompanying signs of excavation, ranging from targeted digging that resembles the work of Magellanic Woodpeckers (as on the left branch below) to the appearance of having been attacked with a hatchet. We think this work has strong potential for ivorybills, since we’ve found only three examples of it, in close proximity, and in an area with an abundance of other suggestive sign. It’s important to point out that when I use the word “scaling”, I am referring only to the clean removal of bark with little or no damage to underlying sapwood. While I have been quite adamant about this as a characteristic, some elaboration is probably in order, as my statements were made in reaction to woodpecker work that was often described as “scaling” in the early search years but was really bark removal in conjunction with excavation, something that’s typical of Pileated Woodpeckers. There still seems to be a good deal of misunderstanding on this subject, and the distinction is not always easy to communicate. On close examination of some scaled areas, especially in category 1 but also in others, there are signs of targeted digging (but not deep or extensive excavation). This can range from a very slight expansion of an exit tunnel, apparently by probing with the tip of the bill, to what may be a harder strike or two, to a somewhat deeper but still targeted dig into the sapwood. Since many other species of woodpecker are capable of doing such targeted digging, I only consider this aspect when it’s in association with extensive, contiguous removal of bark. This will be explored in more depth in the next post in the series. In category 1, known ivorybill prey species have been found under the bark or on the scaled surface of two trees. When exit tunnels are found on these trees in this category, they are consistent with infestation by large Cerambycid beetle larvae. I hypothesize that these trees are being scaled when the gregarious larvae have dug their exit tunnels but have not yet sealed their pupation chambers. This would be the stage at which they are most nutritious and most easily accessible for a species of woodpecker adapted to bark scaling, but the opportunity exists only within a very narrow time frame. It’s also important to note that we have reason to believe that at least some of the work in all categories is being done by woodpeckers. For example, on the downed sweet gum shown above to illustrate category 7, found in November, there is obvious woodpecker work (likely Pileated) on the bole and apparent squirrel work on the upper limbs. Similarly we suspect woodpeckers did the scaling on the larger downed sweet gum (category 5) – mostly scaled higher but with some work within 4’ of the ground. 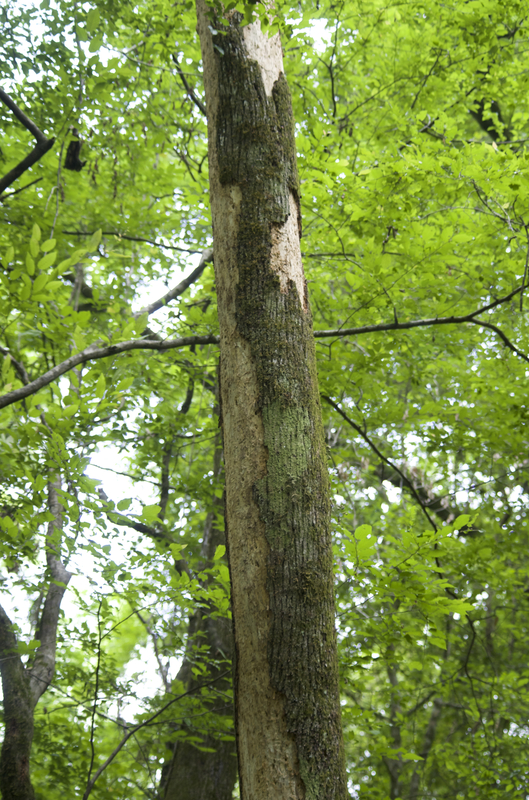 I found this tree in May 2014, approximately 50 yards from the site of where we captured the squirrel stripping bark; while I do not recall looking for or examining bark chips, the edges of the scaled areas appear chiseled rather than gnawed, and the scaling on some of the higher limbs is on the upper side only. The next post on this topic will examined the targeted expansion of exit tunnels and will revisit the similarities between what we’re finding and the work of other Campephilus woodpeckers. The following one will focus on bark chips and distinguishing between signs of gnawing and signs of scaling.